Back cover blurb: I could probably have been an actress. It is not difficult to pretend to be somebody else. Isn't that what I've been doing for most of my life? Cordelia Russell has been living on the French Riviera for twenty-five years, passing herself off as an English socialite. But her luck, and the kindness of strangers, have run out. The arrival of a visitor from her distant past shocks Cordelia. She reacts violently to the intrusion and flees her grotty flat to spend a drunken night at a glittering party. As dawn breaks she stumbles home through the back streets. Even before she opens her door she can hear the flies buzzing. She did not expect the corpse inside to start decomposing quite so quickly . . .
Cordelia (Delia) Russell is an adult observing a corpse in her home when we first meet her at the beginning of this novel. There is something about Cordelia that is difficult to put your finger on. You get the feeling almost immediately that you shouldn’t trust her, but you don’t quite know why. We are then taken back to Delia’s (as she was known then) childhood on the remote island off the cost of Ireland. The opinion of the mainlanders is that everyone on the Island is strange, it has a reputation for inbreeding. But Delia is a beautiful young girl, the apple of her Father’s eye. Martin O’Flaherty is obsessed with his daughter, and largely ignores his wife and sons. It is this obsession that I think is ultimately where Delia’s issues start. Put on a pedestal by her devoted father, she can do no wrong. So when she finds herself alone on the mainland, taken in by the family that find her wandering the streets whilst she awaits her fathers arrival, Delia is unsure for the first time in her life how to behave. When tragedy strikes, her behaviour only becomes worse until she is finally adopted a couple from Westport. Delia’s childhood is unremarkable, but when she becomes a teenager, she realises how she can use her beauty to her advantage. What follows next as we follow Delia’s journey is at times shocking, unfortunate and mostly of her own making. 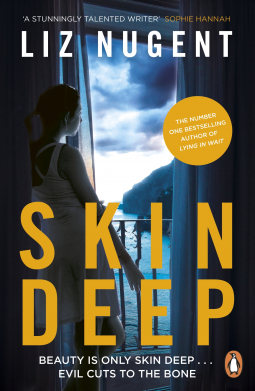 Skin Deep is at times a dark and disturbing novel, that may make at times for uncomfortable reading, but it is 100% worth it. Skin Deep is available now via Amazon online and all good book shops.